This Sunday is Palm Sunday. To kick off our Holy Week, we have a fun craft project planned to help us get into the spirit of the season. 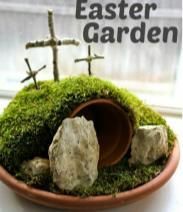 We will be making Easter Gardens for each child to bring home. In order to have enough supplies, please let Dena know if your child will be attending Sunday School on Sunday. Email dena@stsimon.ca or call the office. The more, the merrier. Hope to see you there. Copyright © 2019 St. Simon’s Anglican Church, All rights reserved. If you would like to subscribe to our electronic mailing list, please fill the form and sign up. You will receive regular updates on our services, parish news, and church events via email.